It is critically important to recognize oral health problems in pets as early as possible. This will improve the success of treatments (improve prognosis), lower overall cost of treatment, save your pet's teeth and possibly, save their lives. The procedure is simple and you should bring a list of three important questions about your dog or cat's oral health to the appointment. Cost of Pet Oral Health Screening Exam is the same as our dental consultation fees. These fees change in time but our goal is to provide the highest value with clear communication. 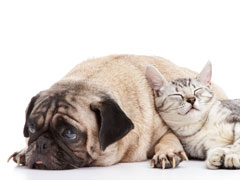 The veterinary dentist will discuss our strategy to diagnose and to treat your pet. You have the opportunity to express your concerns at this consultation. With two way communication, we hope to provide care needed. If your pet allows an oral exam we will look for broken, discolored, diseased teeth and other findings. Dental consultation from the veterinary dentist will be limited for the Oral Health Screening, but expanded if the pet's teeth are cleaned. * Oral Health Screening Exams will be provided when scheduling allows.